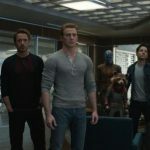 Moscow Copper provided product for this post. All opinions are my own. 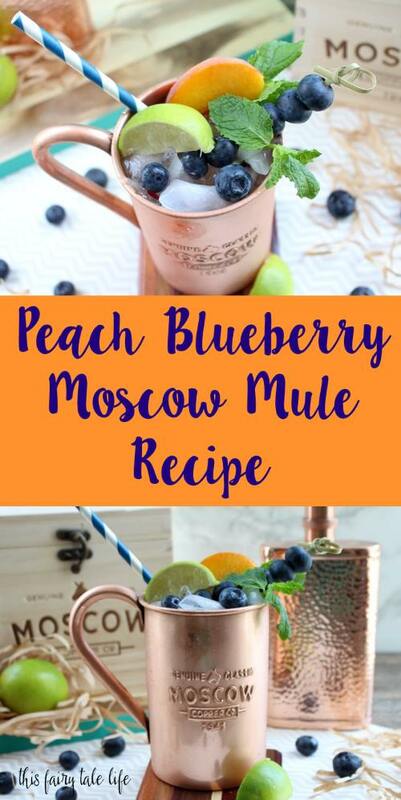 Moscow Mules are one of my favorite summer drinks. Okay, if I’m being honest, they are one of my favorite winter drinks, too. I absolutely love the bite of ginger beer and I love experimenting with different types of vodka and different ingredients. I had this idea for a Peach Moscow Mule using peach flavored vodka, but with just the peach and ginger beer it was a little too sweet (even for me)! Adding the juice from a few tangy blueberries totally balanced everything out. 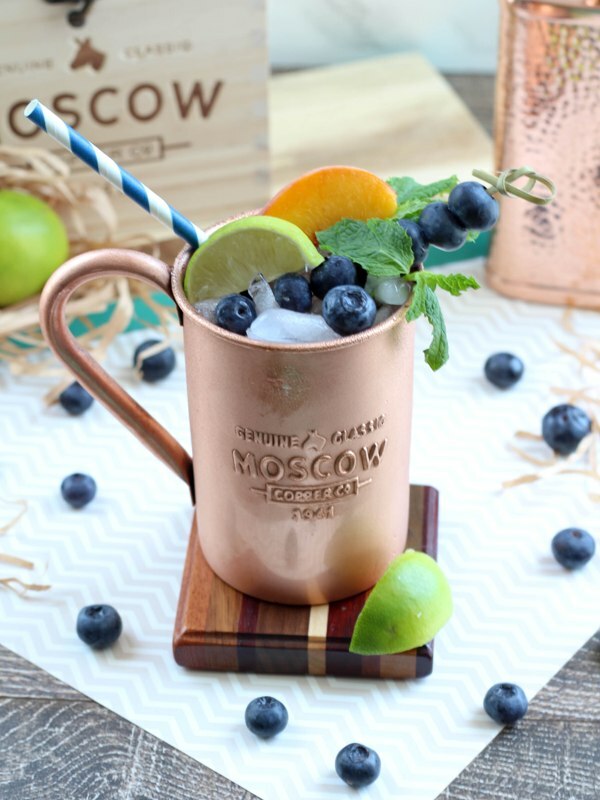 And of course, Moscow Mules taste best in a 100% pure copper mug, like the ones from Moscow Copper. 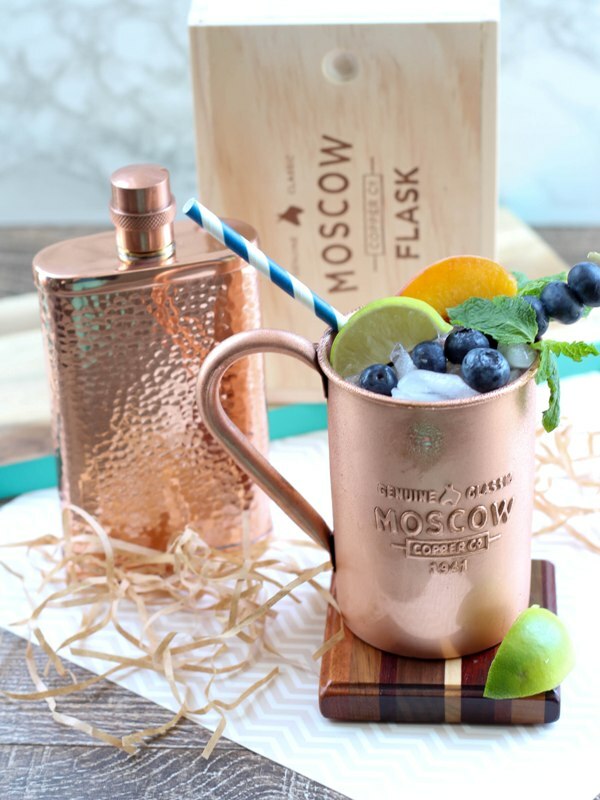 Moscow Copper offers the original copper mug, crafted to the same specifications of the first copper mugs out of Russia. These mugs are the real deal, folks! I can’t get over how shiny and pretty they are in person, and I love the raised logo stamped on the side. I hope you enjoy this recipe; let me know if you try it at home! 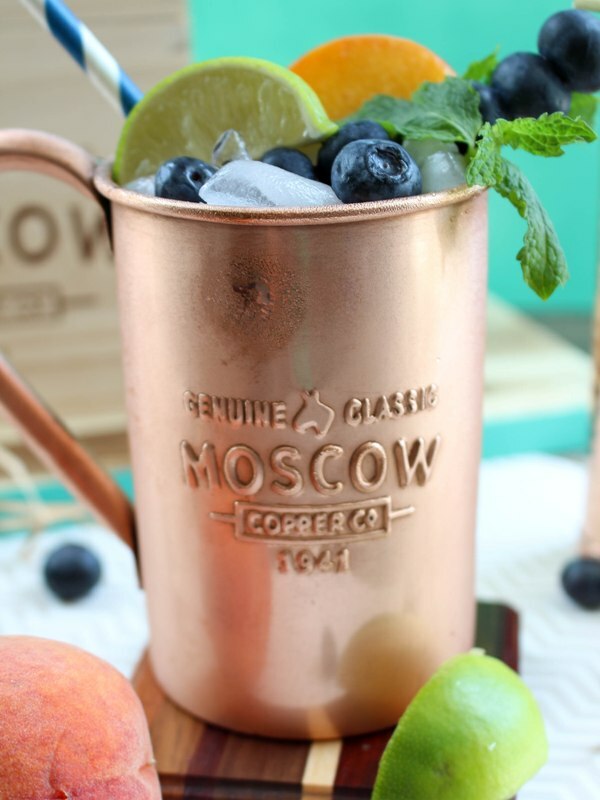 Fill your Moscow Copper mug with ice. Muddle the blueberries and strain the juice into a separate glass. Add the peach vodka and ginger beer and stir gently. Pour the contents into the copper mug. Squeeze a lime wedge on top of the drink and stir gently. Discard the lime wedge or add it to your drink as garnish. 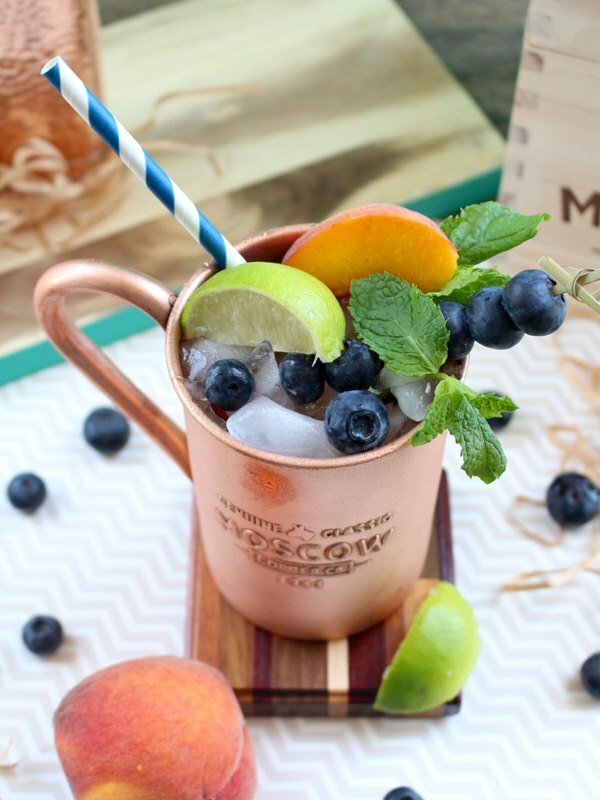 Garnish with blueberries, peach slices, and a sprig of mint, if desired. 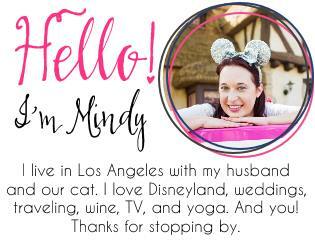 And if you’re looking for an original bridesmaids or groomsmen gift, I think a little bundle of Moscow Mule ingredients and accessories would be perfect. 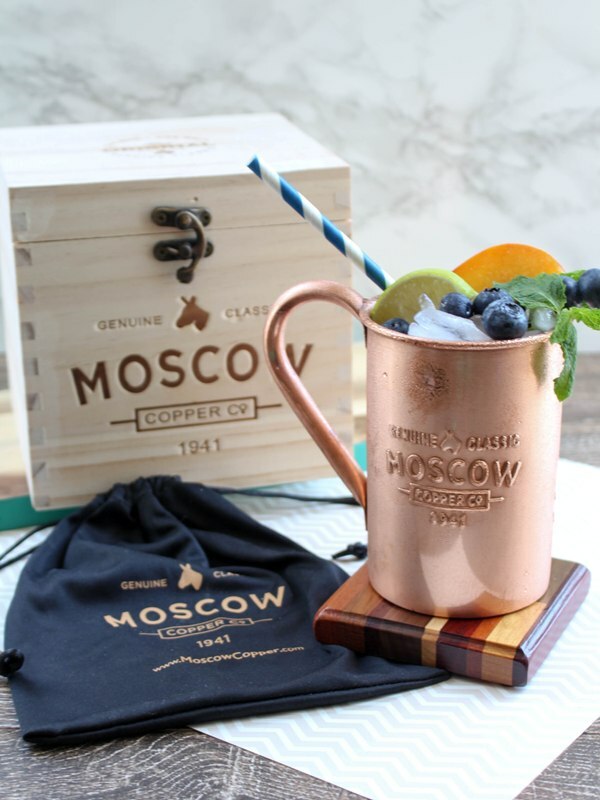 Combine a Moscow Copper mug with a small bottle of vodka, a bottle of ginger beer, and a lime into a basket for a gift your attendants are sure to love. 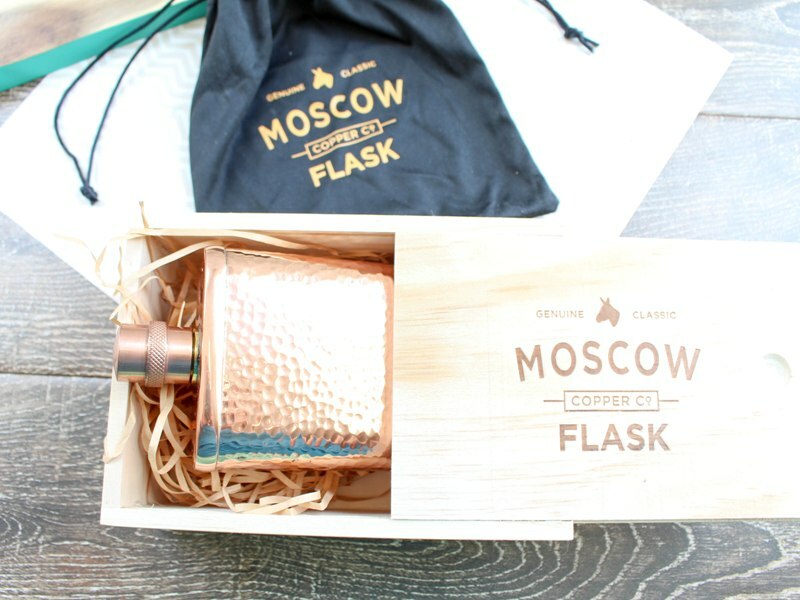 Or check out these Moscow Copper “hammered” copper flasks. This is a statement piece if I’ve ever seen one. It’s a great addition to our bar cart. And this sucker is HEAVY – it shows you mean business. The mugs and flasks both come in their own pine wood box with a protective drawstring bag and microfiber polishing cloth. I was super impressed with the presentation. 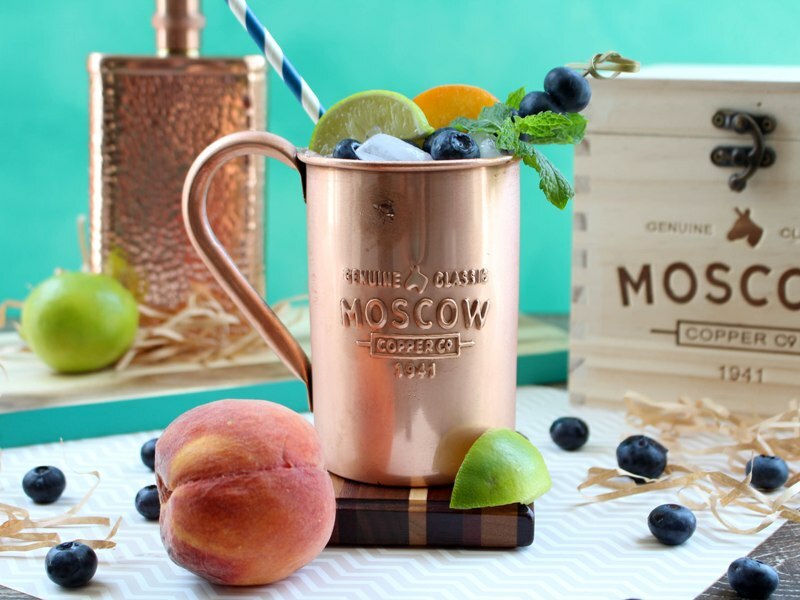 If you want to go REALLY big, the Moscow Copper mugs would make memorable wedding favors. 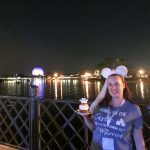 You can set up a “make your own Moscow Mule” bar and guests get to take the mugs home. This is one wedding favor that won’t end up being left behind. 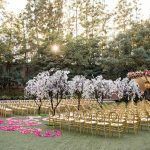 And if you do this at your wedding … please be sure to send me an invite. Because I can’t turn down a Moscow Mule, ever. 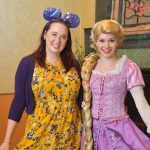 Thank you Moscow Copper for partnering with me for this article.